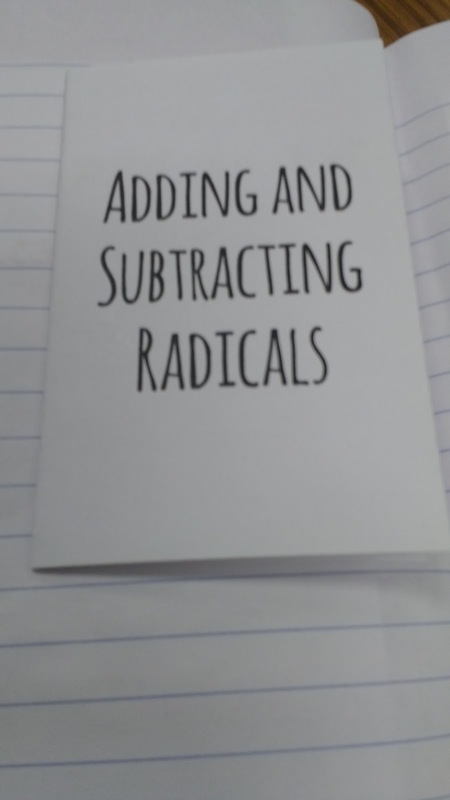 We recently finished our unit on radicals in Algebra 1. 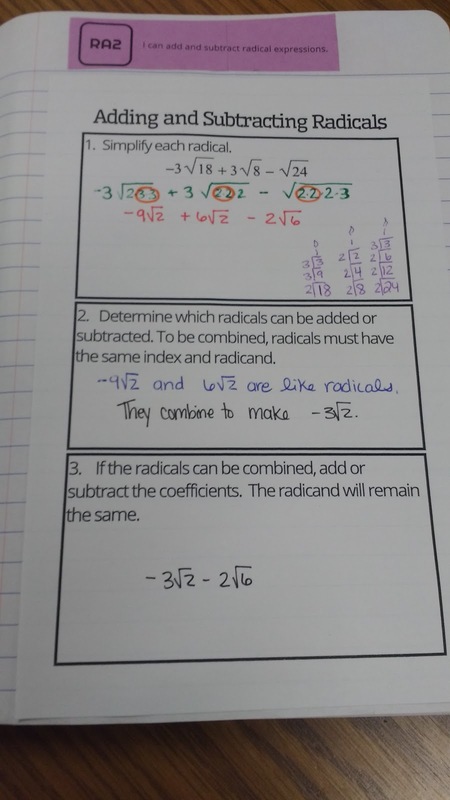 Now that we're on to polynomials, I thought I would share our notebook pages and activities for radicals. 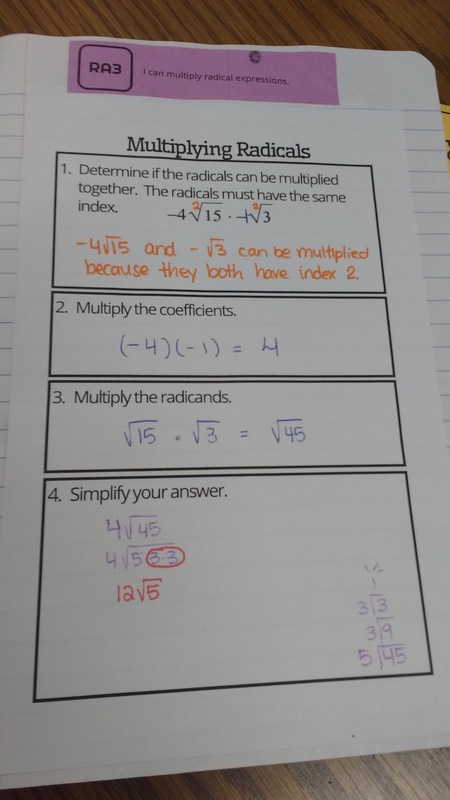 Each unit begins with a divider. 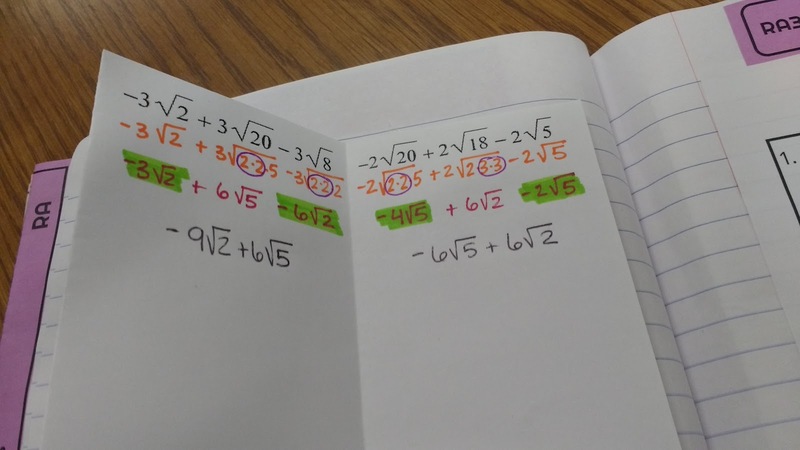 I blogged about these dividers in more detail here. The other side of the divider includes a list of our SBG skills for the unit. 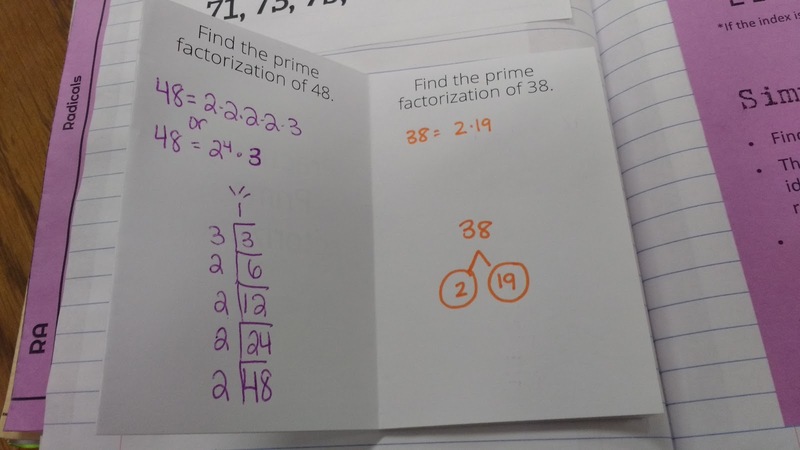 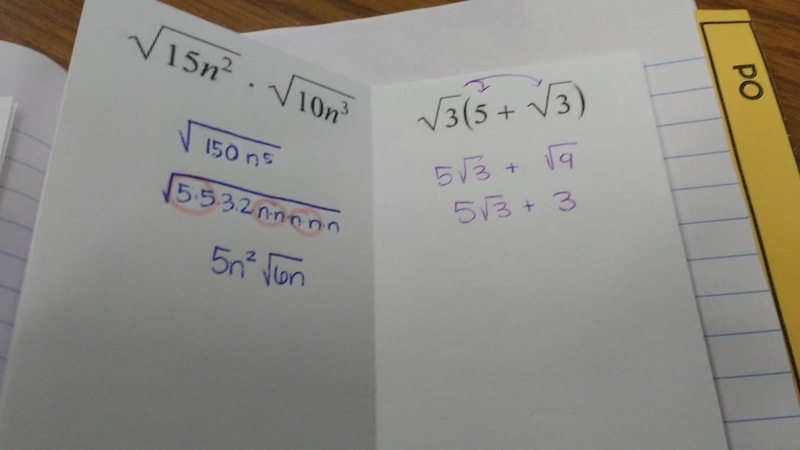 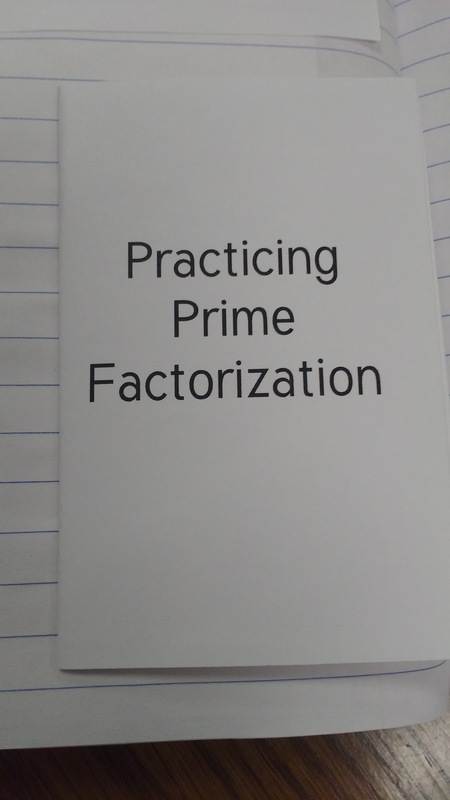 I've already blogged about these first few pages in a post titled "Reviewing Prime Factorization at the High School Level." I explained in this post why I prefer using the birthday cake method for prime factorization instead of the more traditional factor tree method. 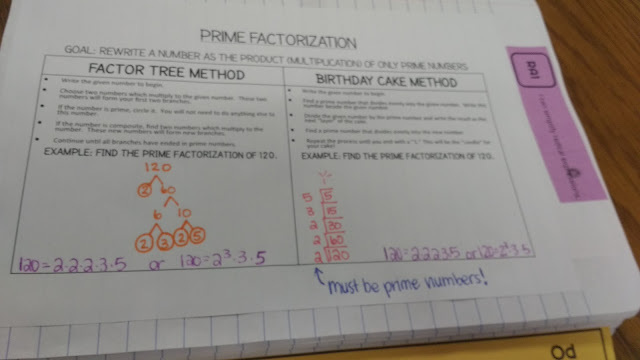 Even though I prefer the birthday cake method for finding prime factorization, I showed both methods to my students. They were allowed to choose the method that they preferred. I gave my students a chart of the prime numbers below 100 to glue in their notebooks. 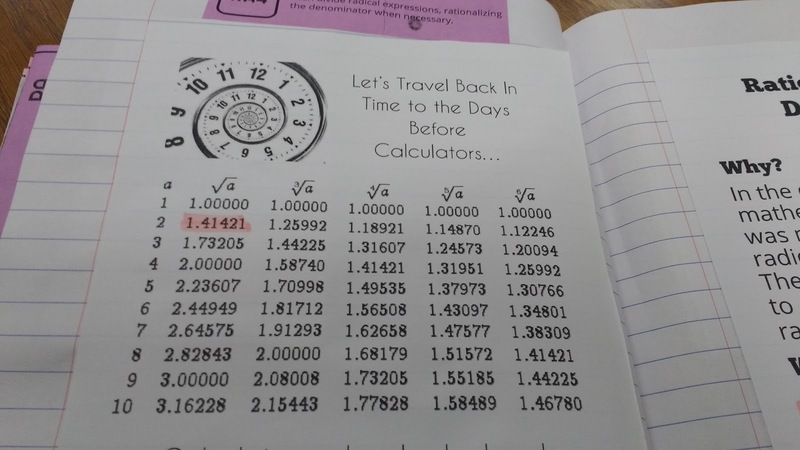 Some of my students love this chart. Others prefer to use the poster I made to hang on the wall of our classroom. I am SUPER-picky about vocabulary throughout this unit. 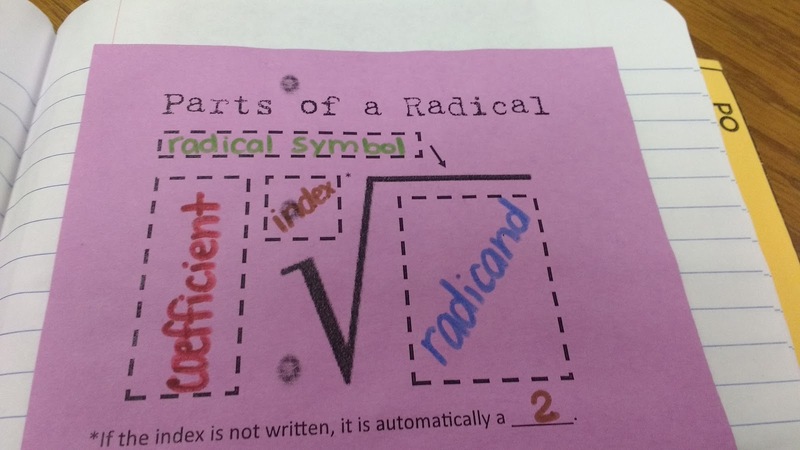 This quick graphic organizer is a handy reference for my students as they are trying to keep their radicands, indices, and coefficients straight. 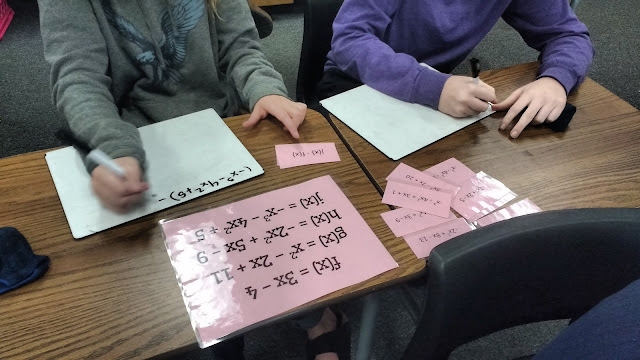 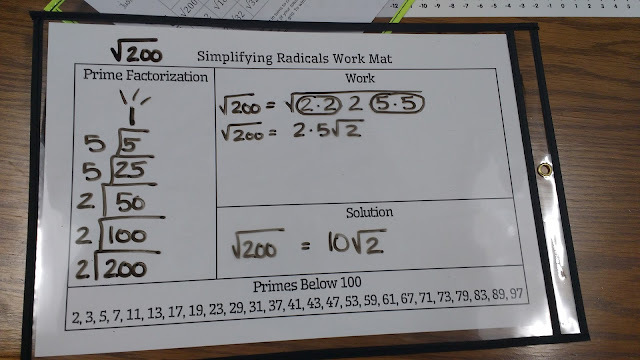 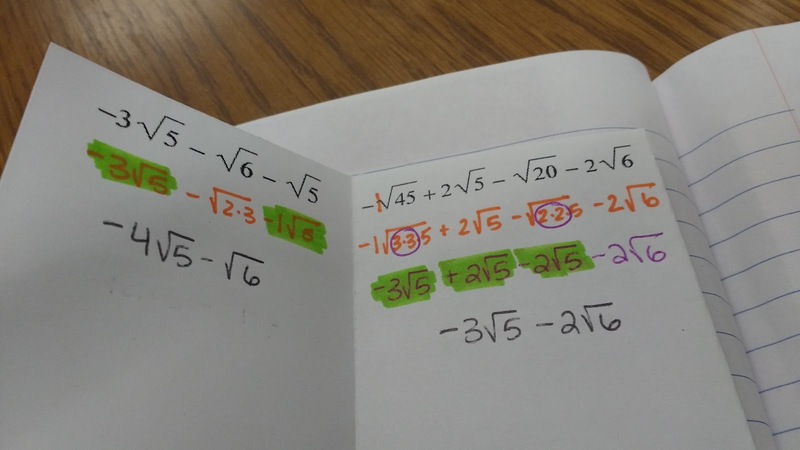 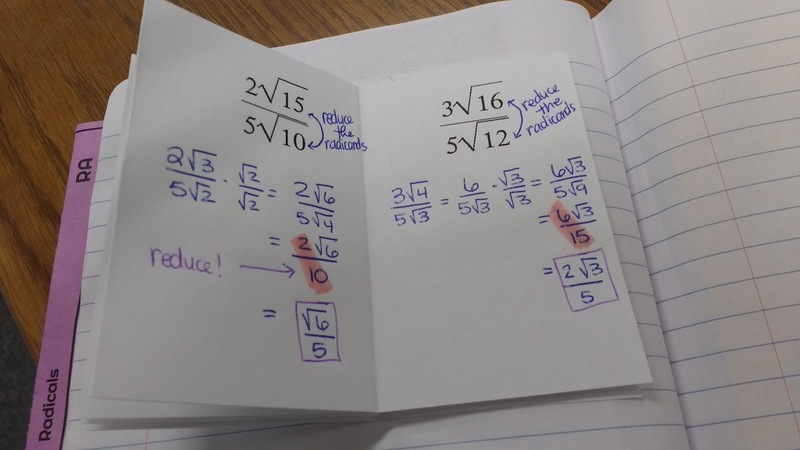 You can read more about the dry erase work mat I made for my students to use when simplifying radicals in this blog post. Up next is adding and subtracting radicals. 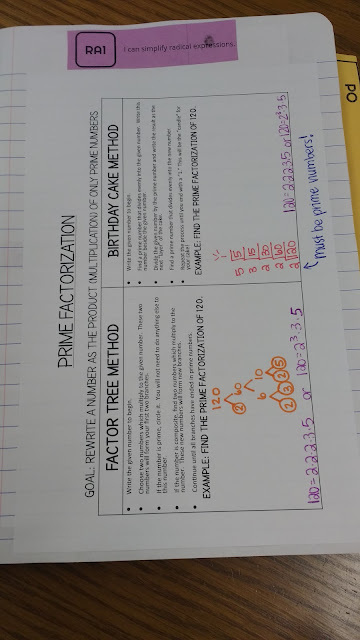 I'm pretty happy with this new graphic organizer I came up with. 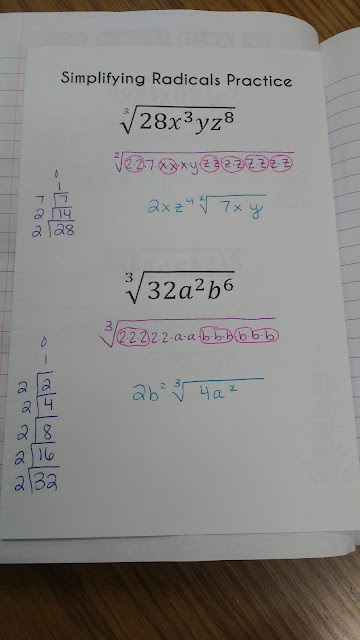 My students seemed to reference it quite a bit. 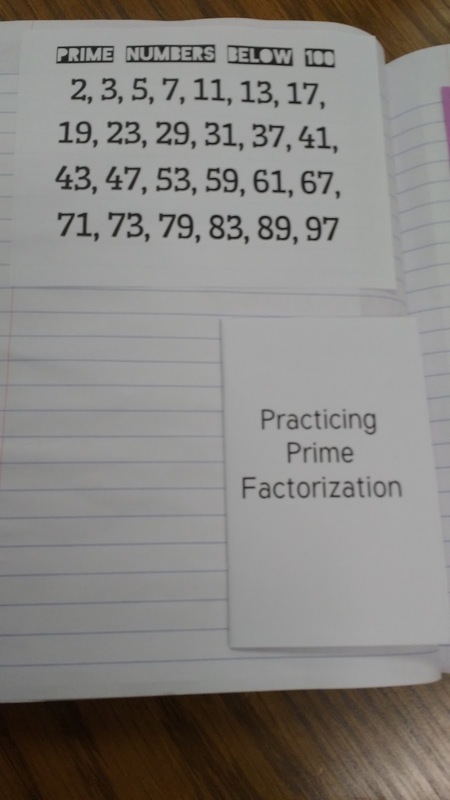 Since the practice book doesn't take up much of the page, I told my students that they could use this blank space to keep their prime factorizations for future reference. 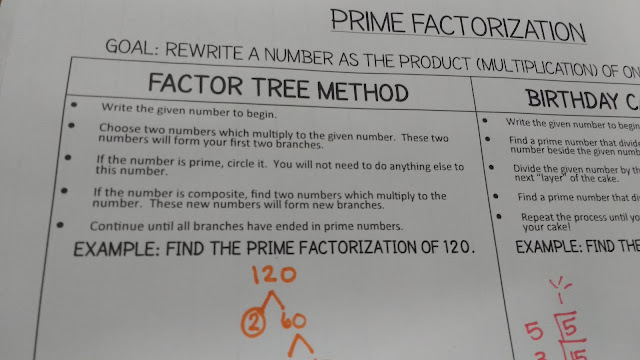 Then, they could re-use these prime factorizations when similar problems came up in the future. 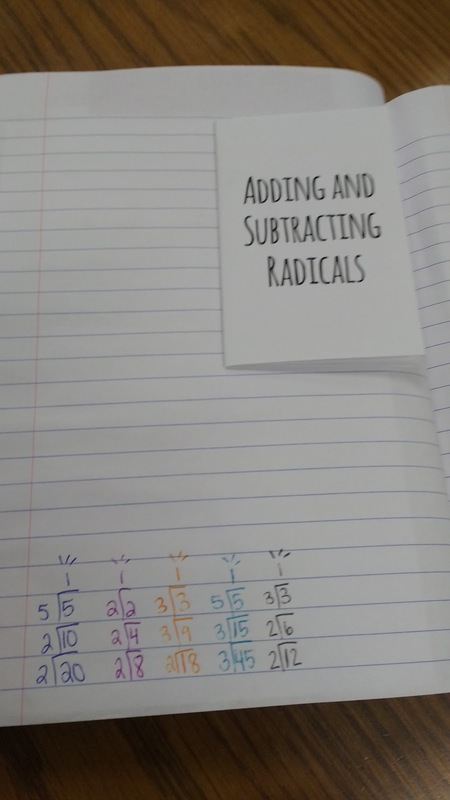 I modified my adding and subtracting radicals graphic organizer to make this multiplying radicals graphic organizer. 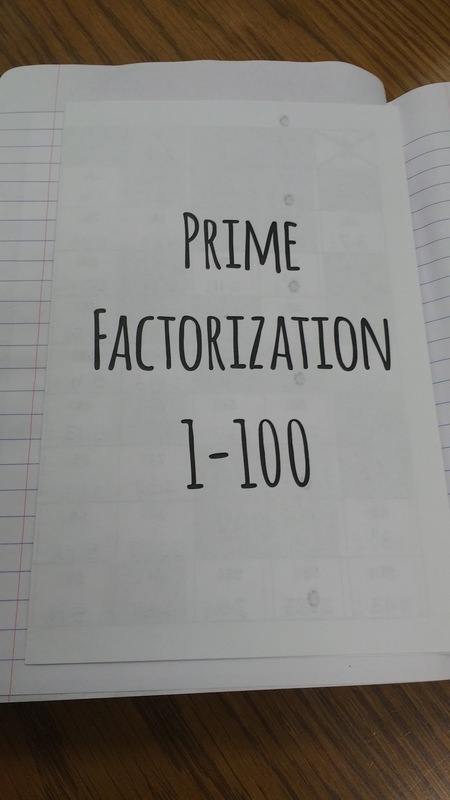 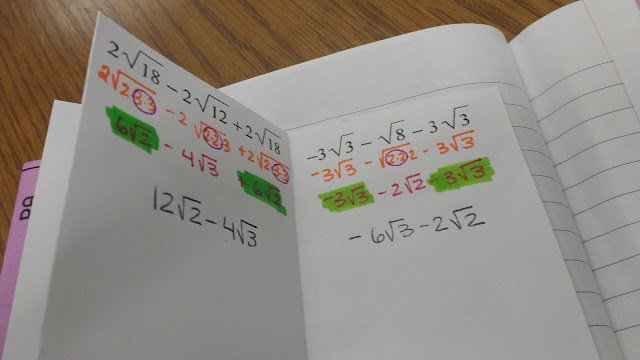 One of my students suggested that it would be super-cool if we had a page in our notebook that provided us with the prime factorization for every single number. 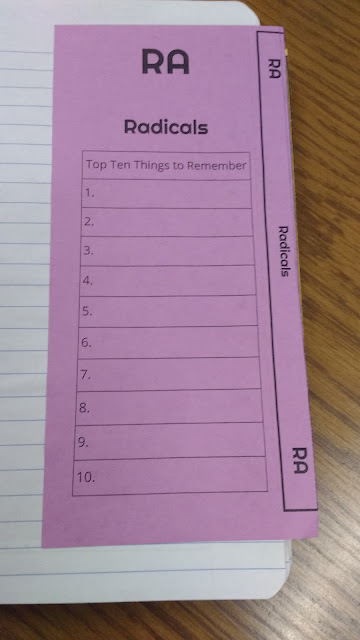 I made this chart for students to glue in with the numbers between 1 and 100. Of course, I didn't give my students the prime factorization for each number. They had to fill those in themselves! Some of my students really took to this idea, and they used their spare time in class over a few days to complete the entire chart. After multiplying comes dividing. 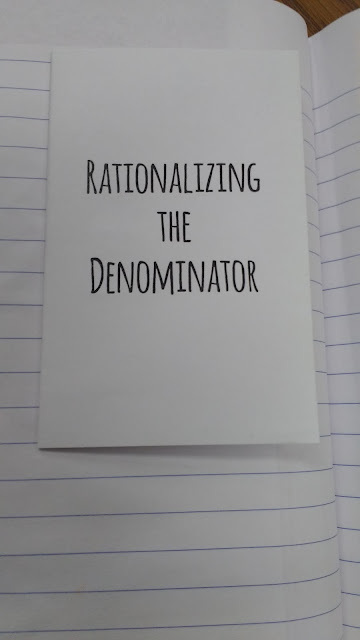 Of course, that means we have to learn to rationalize the denominator. 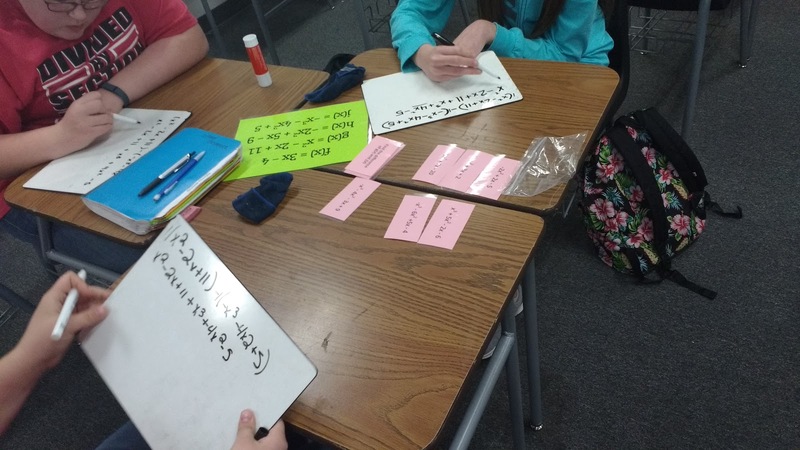 Oklahoma adopted new math standards this year that specify that Algebra 1 students must be able to rationalize the denominator. 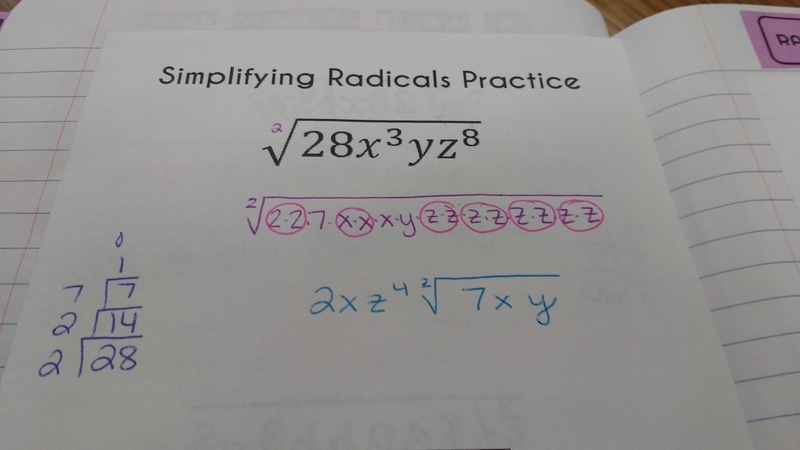 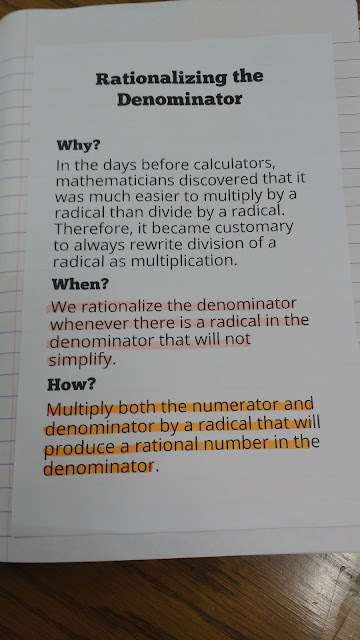 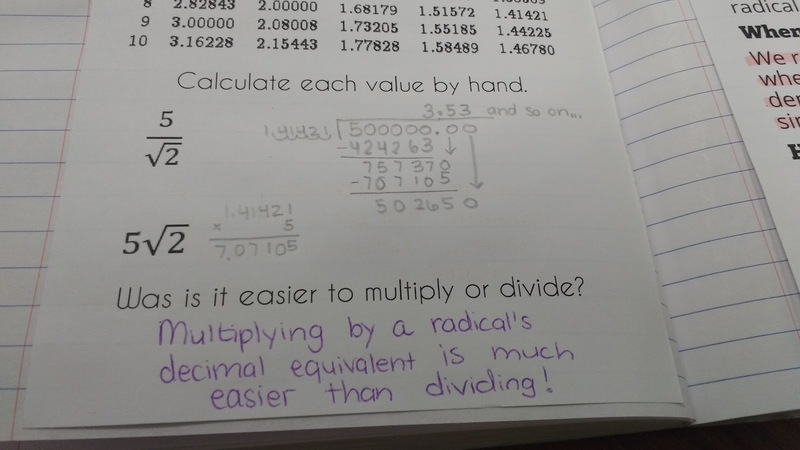 Whenever I've taught rationalizing the denominator in the past, students often questioned why we weren't allowed to have a radical in the denominator. 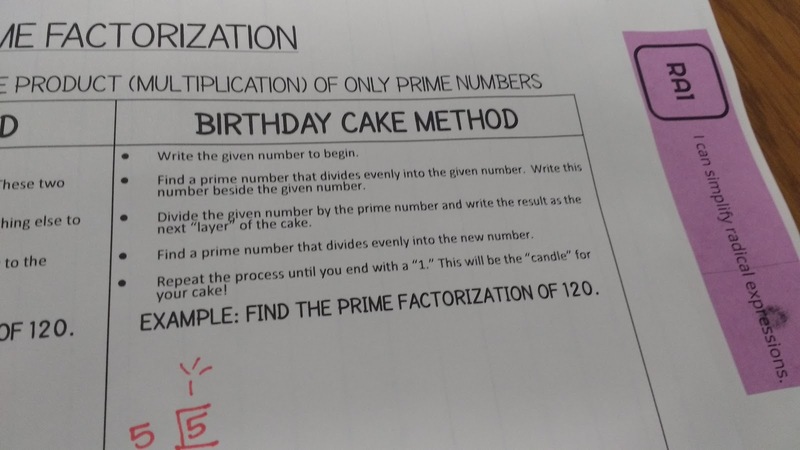 I tried to explain how it was a sort of math "tradition," but I'm not sure my students fully understood the reason it became a tradition. 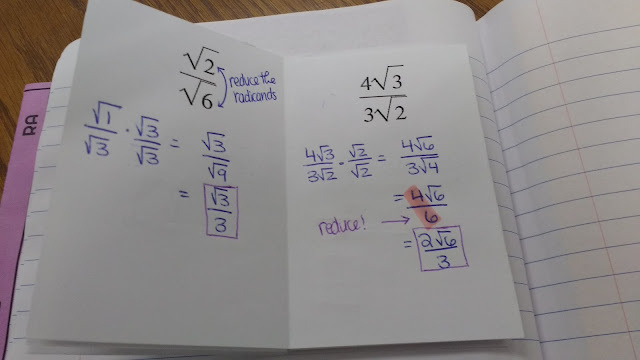 I learned about this at a workshop that I blogged about here. Now that we live in the days of a smartphone in every pocket, it's hard to imagine what life was like in the days before calculators. 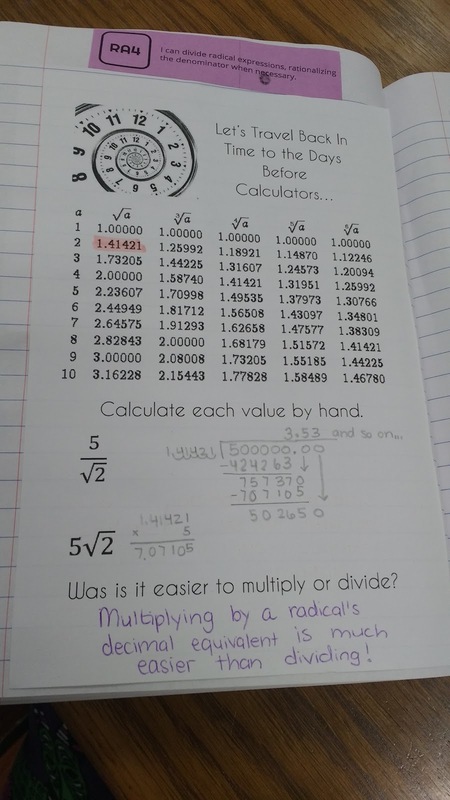 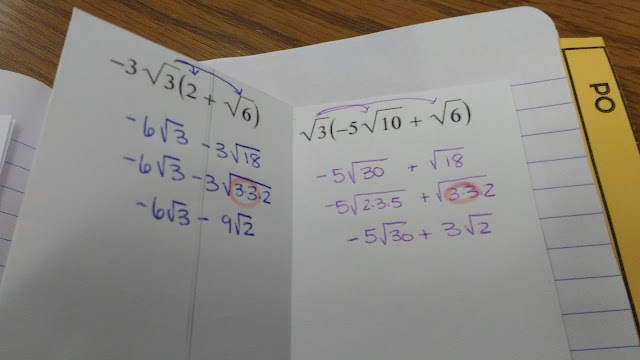 So, for this activity, I made my students put away their calculators and do some math by hand. 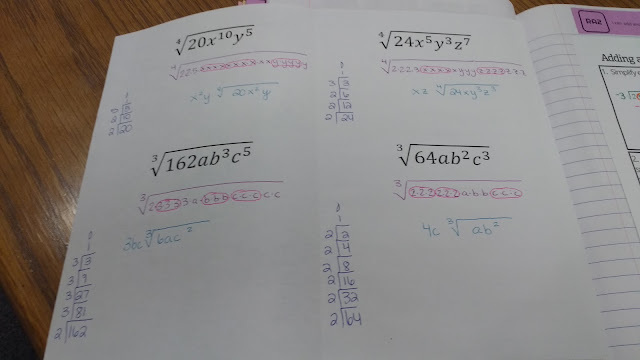 First, we discussed how people found various mathematical values using books of tables in the days before calculators. 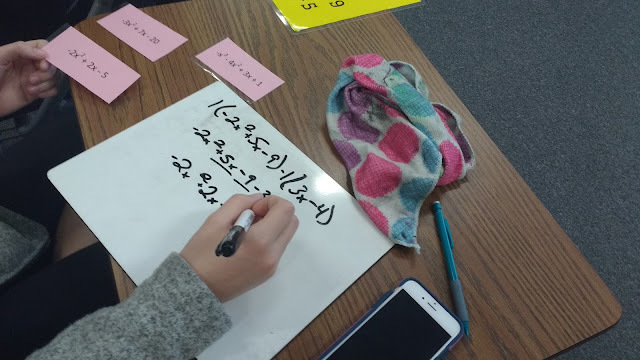 Students were confused about how to read the table, but I think they caught on after a bit. 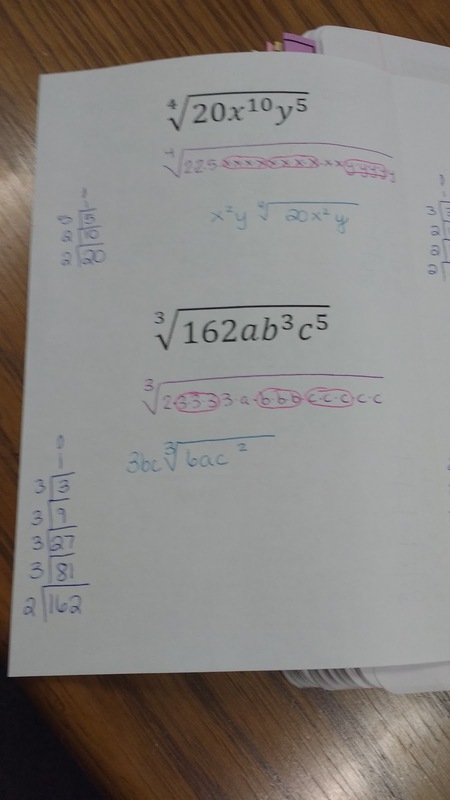 I asked them to calculate two values by hand using the decimal approximations from the table. 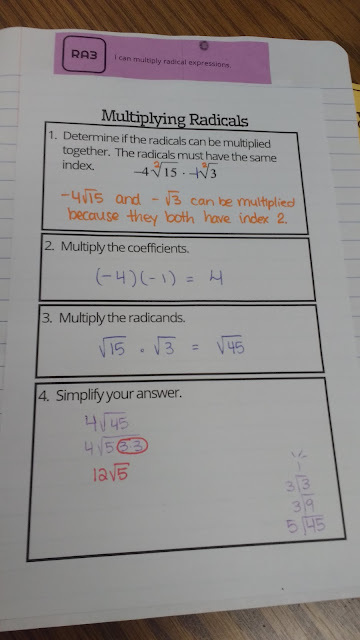 Students had to find five divided by root two and five multiplied by root two. My students flew through the calculation for five times root two. They couldn't even remember how to set up the long division problem for five divided by root two. We ended up doing that one together! 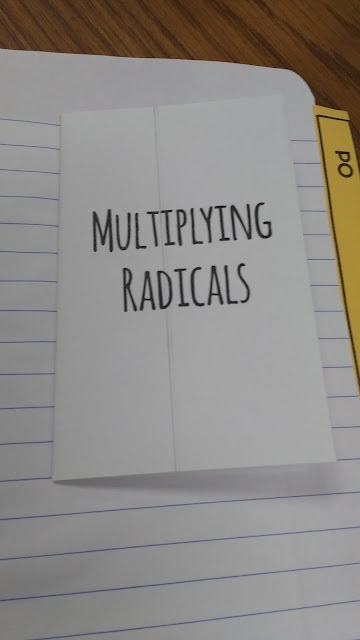 They all agreed that multiplying by a radical was MUCH easier than dividing by a radical! 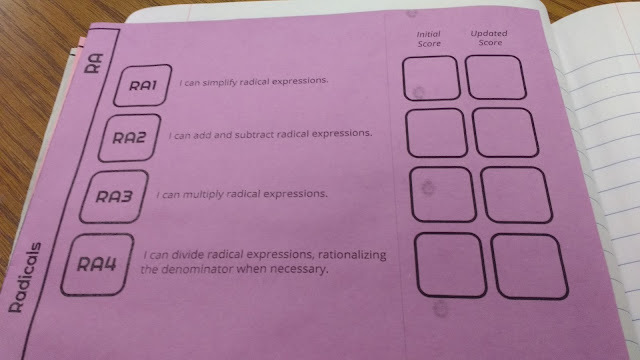 I never ended up making a dividing radicals graphic organizer to go along with the graphic organizers for adding/subtracting radicals and multiplying radicals. 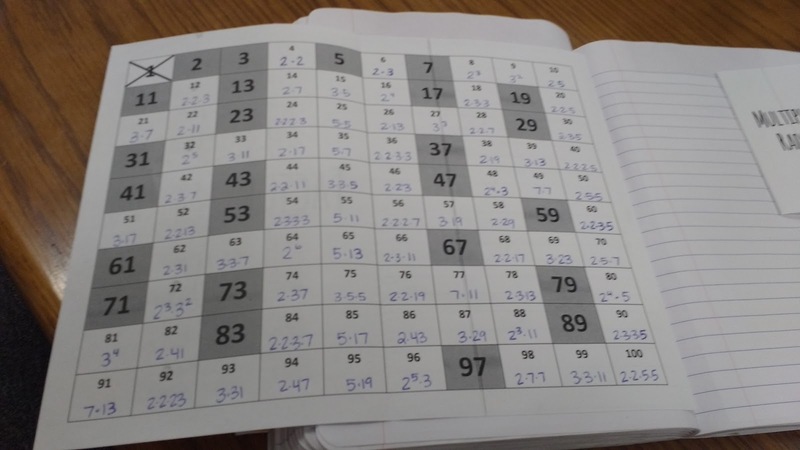 This is definitely on my to do list for next year! And, that wraps up our unit on radicals! 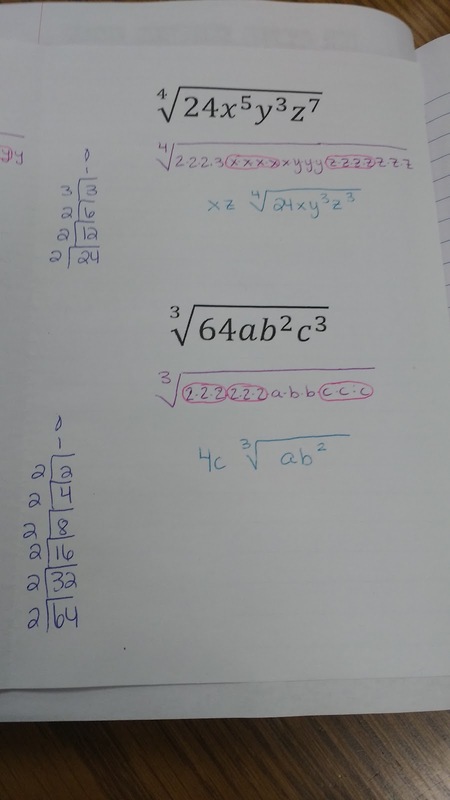 Files are uploaded here. My Algebra 1 students are currently working their way through our unit on polynomials. We have new math standards in Oklahoma this year which has required me to change things up a bit. 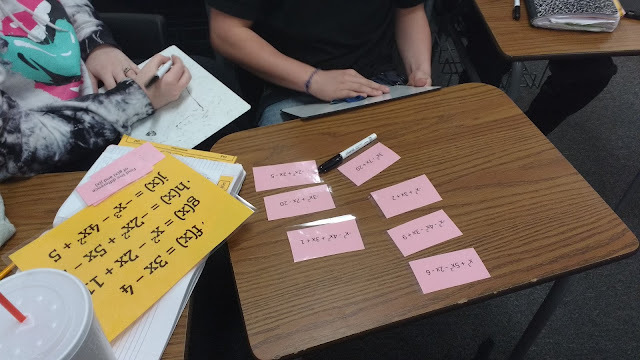 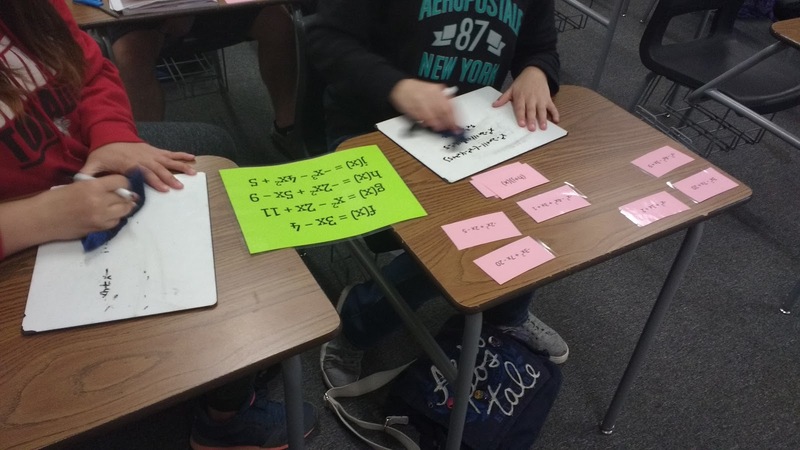 In the past, my students needed to know how to add, subtract, multiply, and factor polynomials. 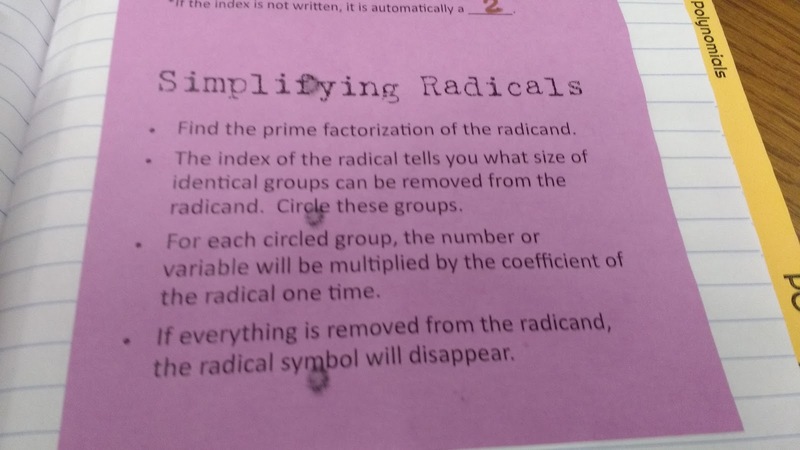 The new standards STILL have them doing all of that. 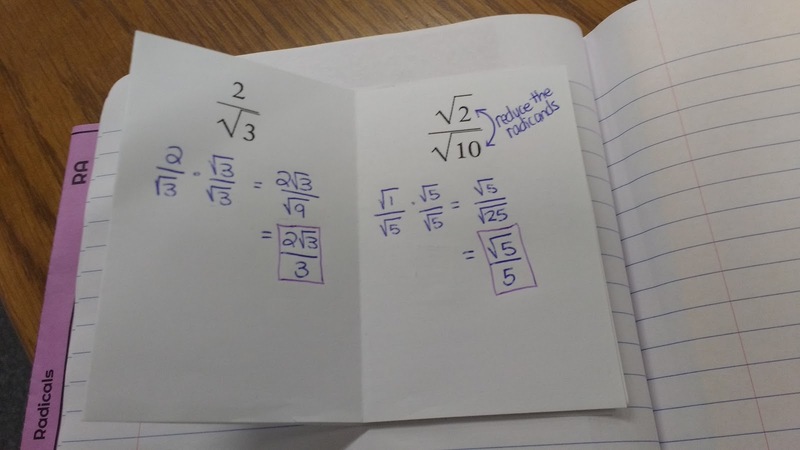 But, they also need to be able to add, subtract, and multiply functions written in function notation. We do functions and function notation waaaaaaaaaaaayyyyyy before we ever talk about polynomials. So, I decided to kill two birds with one stone and combine these two skills. 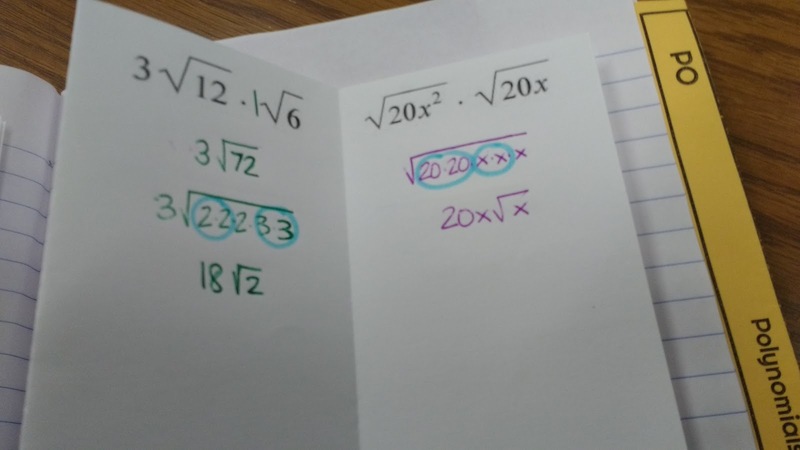 I made a question stack for my students to use to practice adding and subtracting polynomials in function notation. If you don't know how a question stack works, this post explains it pretty well. Basically, students are given a set of 10 double-sided cards. Students lay the cards out with the ANSWERS facing up to form an answer bank. 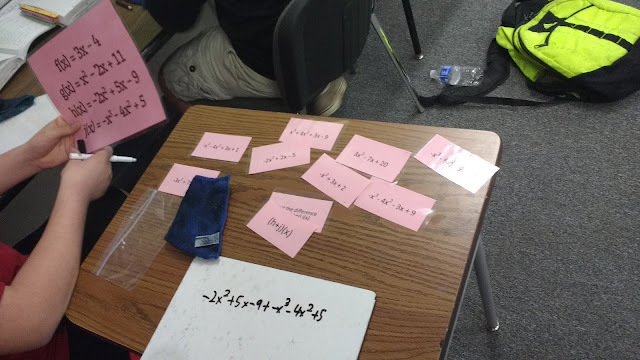 Students choose one card to flip over. This will be the first question. When they figure out the answer, they locate that answer in the answer bank. 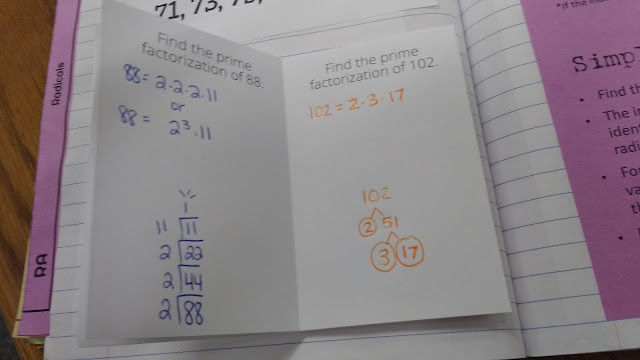 That card is flipped over and stacked on top of the previous card to reveal a new question. 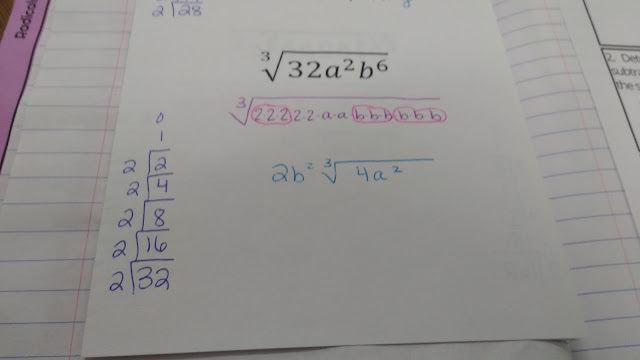 The answer bank gets smaller and smaller as students work problem after problem. 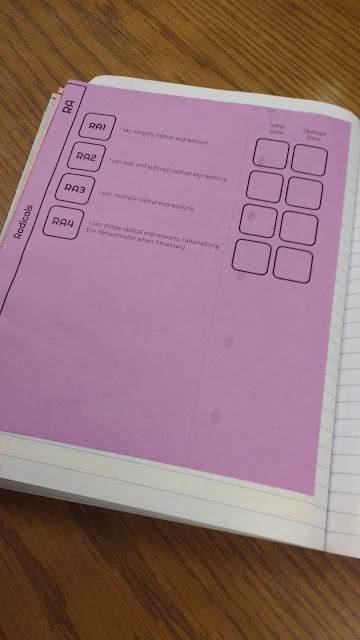 It's self-checking which means I can target my time to helping the groups who need it most. 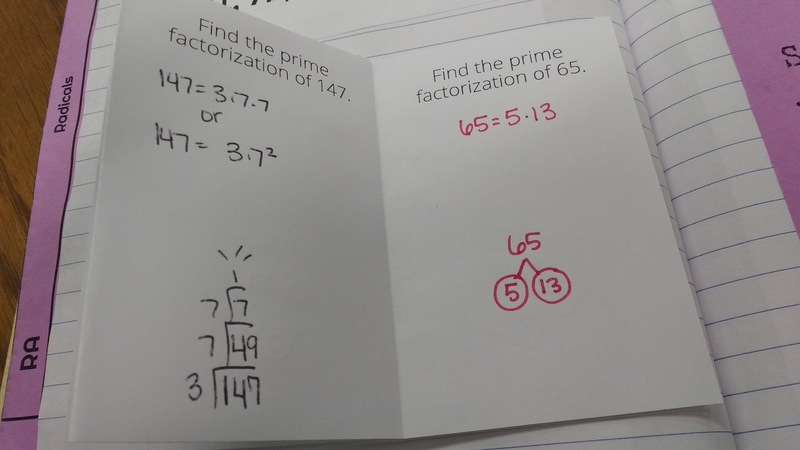 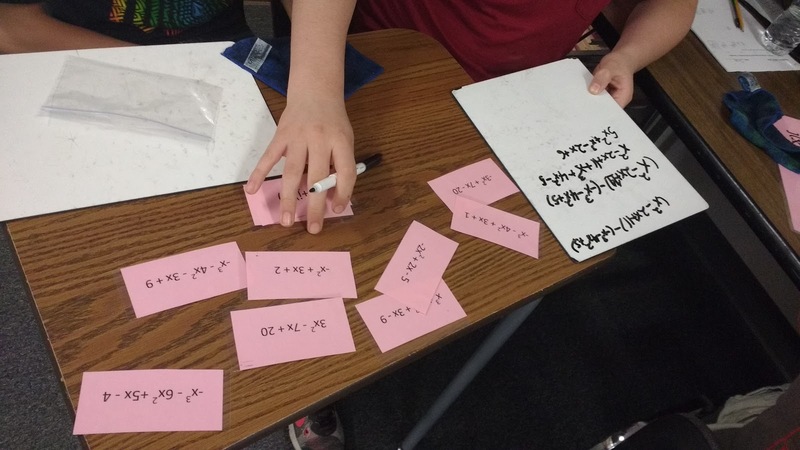 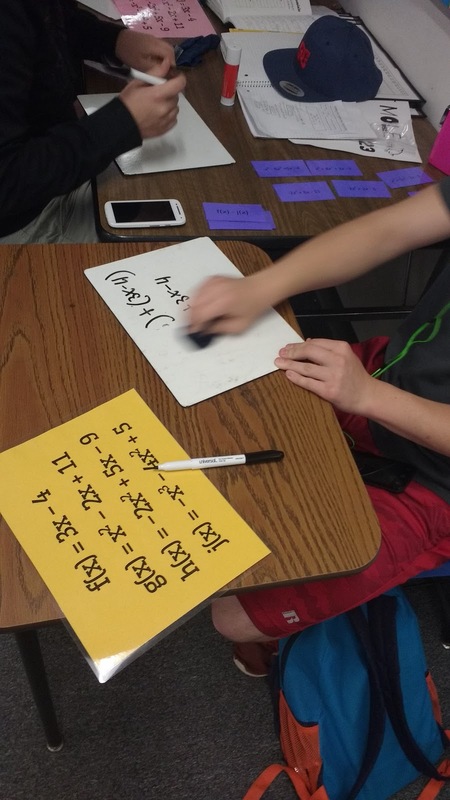 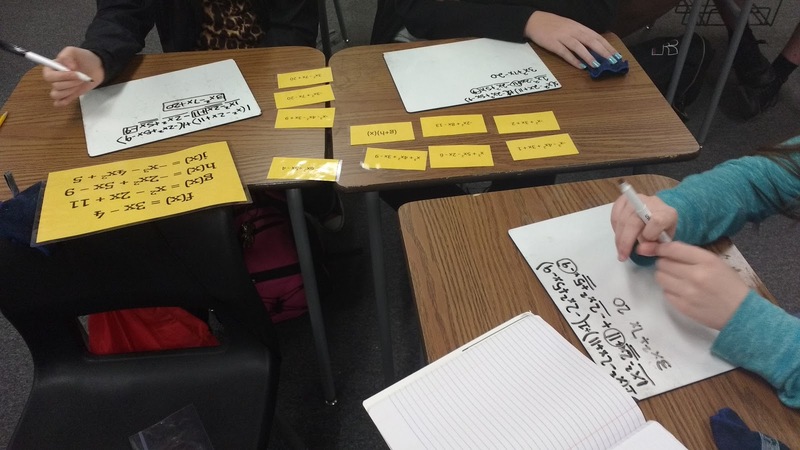 Each group got a laminated page featuring four polynomials and a snack bag with their deck of cards in it. 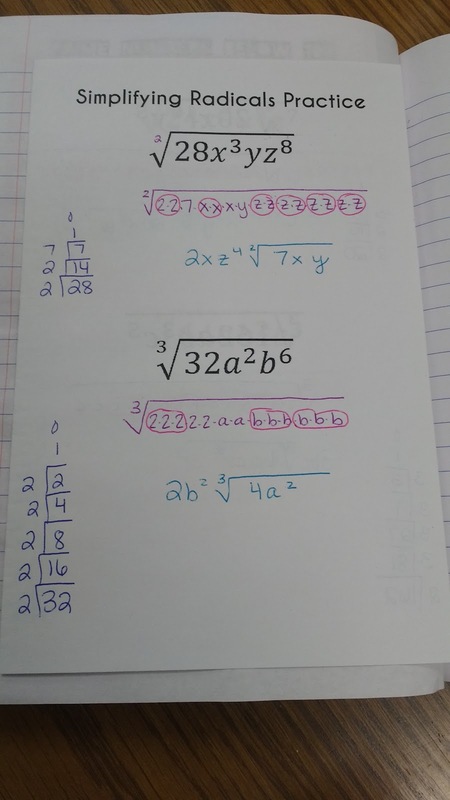 I tried my best to vary the notation so students would be used to the different ways the question could be worded. 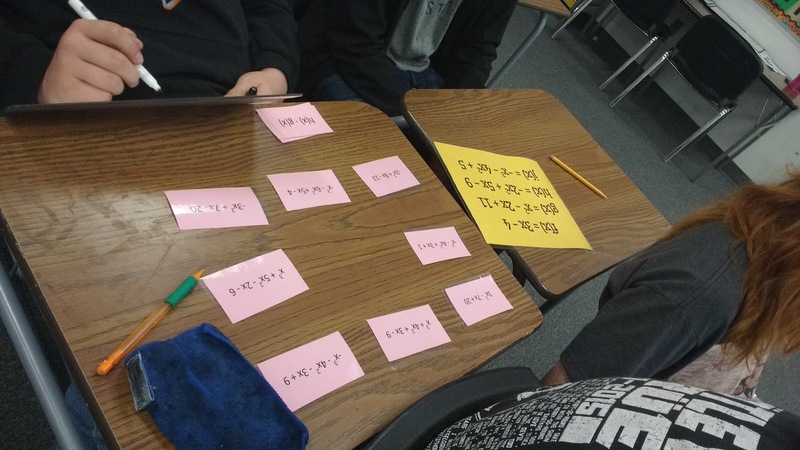 I had my students work in pairs for this activity. 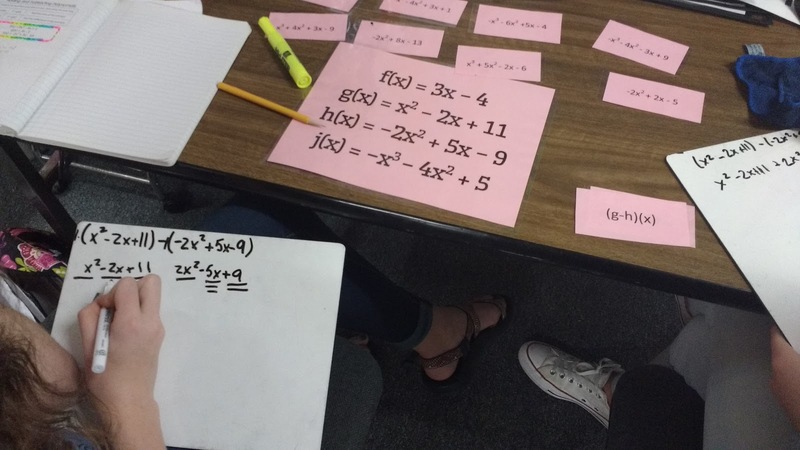 In some class periods, a few students would choose to work alone. 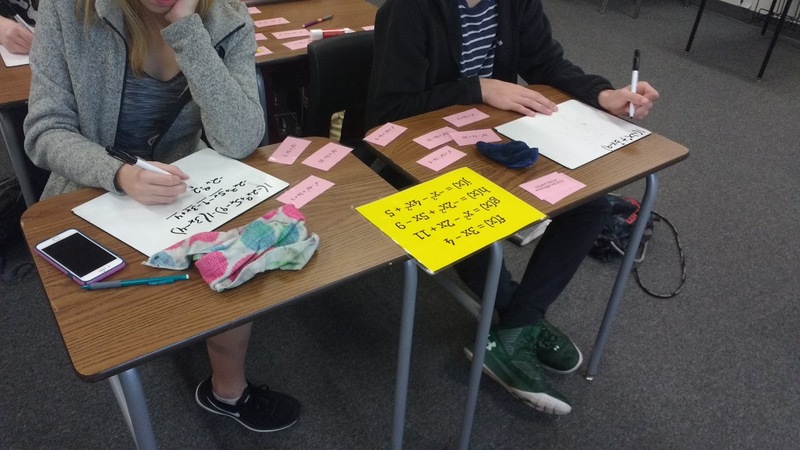 I also had the occasional group of three when the class consisted of an odd number of students. 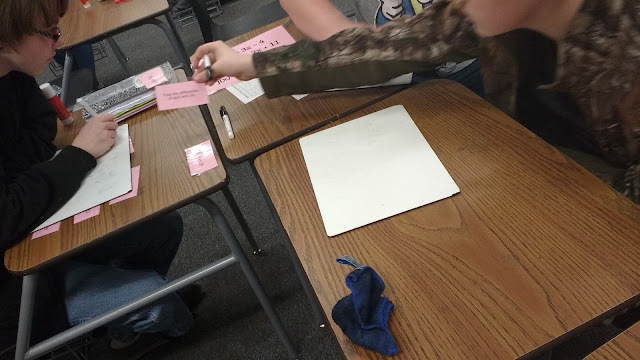 My students were engaged. 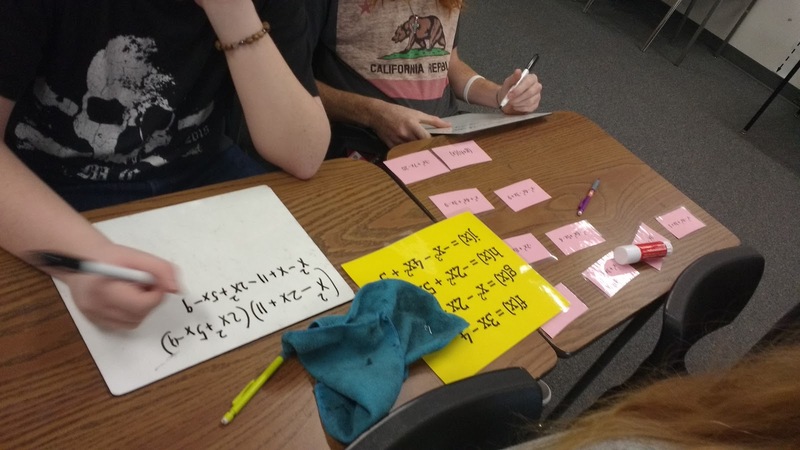 There was good group-talk going on. 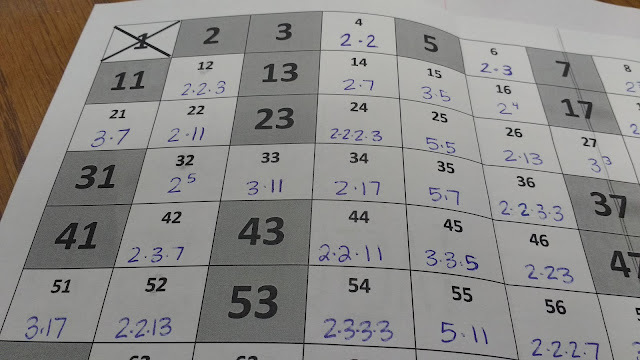 And, we did lots of practice. 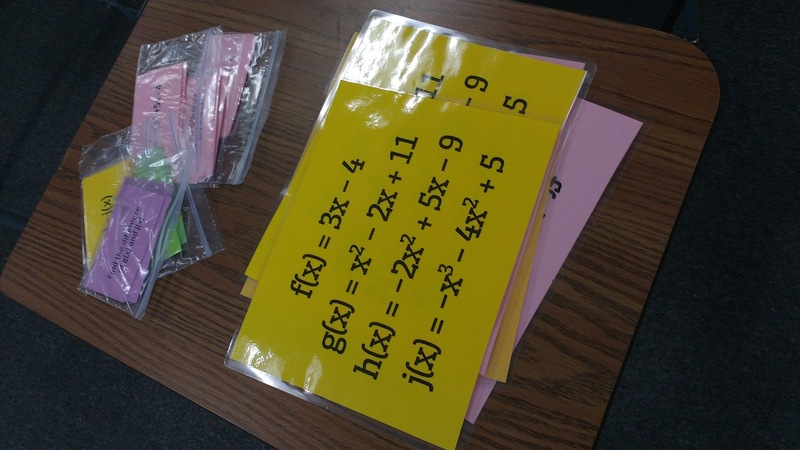 Files for this activity are uploaded here.